There’s a fair volume of information about kefir on this blog. Around 18 months ago I wrote a series of blog posts about how to choose whether or not you use kefir grains or powders and which may be best for you. The grains are amazing; like magical beings that will last your lifetime and that of many more generations. In fact, if they’re used regularly to create kefir milk – and you store them correctly when you’re not using them (and don’t leave them for more than around 6 months in storage) – they could, in theory, last indefinitely. Isn’t that incredible?! The first thing you need to think about, when you’re deciding which kefir to make, is whether or not you have an intolerance to a particular type of milk. Today’s grains are usually cultivated in either goat’s or cow’s milk. Some companies may not specify clear on their websites. There seem to be very few that cultivate in goat’s milk. I’ve included more information about that below. 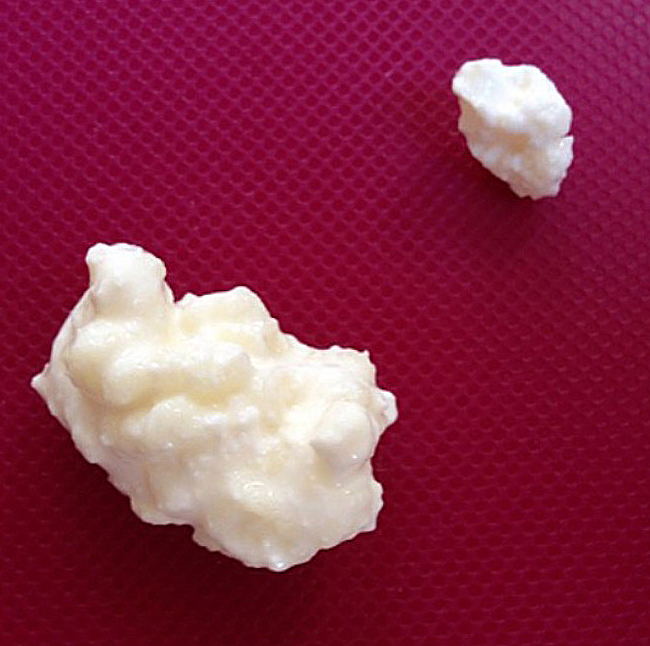 Can Kefir Grains be used for Non-Dairy Milk? Kefir grains need the milk sugars (lactose) to survive, so if you use them to make non-dairy kefir, they will need regularly refreshing in dairy milk. If you don’t do this, the grains are likely to lose their strength and will stop fermenting milk. You have an intolerance to dairy milk. You don’t have time to keep remembering to refresh your grains in dairy milk in between making non-dairy batches of kefir milk. It’s worth noting that there are cases where people with dairy intolerances have been known to be able to digest dairy kefir milk successfully. This is possibly because the milk sugars (the cause of their intolerance) have been broken down and reduced to a point that isn’t an irritant to their digestive system. It may not be the case for everyone, but it’s worth noting. If you buy grains cultivated in cow’s milk, you can still use them going forward with goat’s milk. There will be a minimal residue of cow’s milk in your first batch that will soon be negligible. Check this blog post for kefir starter powder.